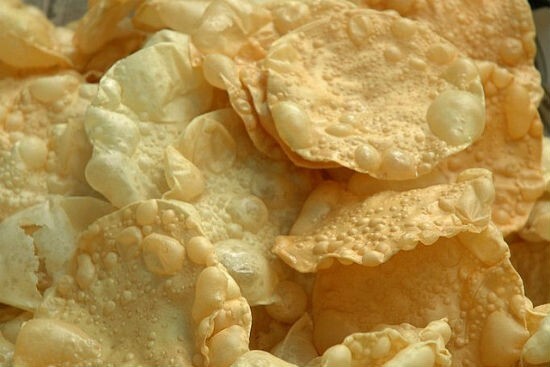 A regular accompaniment to most South Indian meals, Appalams are served as a popular anytime snack. 1. Clean and spread out the urad dal under the sun for a few hours. 2. Then grind to a smooth powder. 3. Add asafoetida powder, cooking soda and salt. 4. Add enough water and knead well to a thick dough. 5. Add oil and cumin seeds. 6. Knead again to a chapati dough consistency. 7. When the dough starts to turn pale yellow, pinch small balls of the dough and roll them out into thin circles. 8. Keep them under the sun (or under the fan) for 30 to 45 minutes or until the moisture has evaporated. 9. Store them in a clean, dry container. 10. Fry them in hot oil and serve with rice or as desired. Feel free to comment or share your thoughts on this Ulundu (Urad) Appalam Recipe from Awesome Cuisine.